Four days to go until people all round the world hit the keyboard or notebook for (inter)NaNoWriMo, or National Novel Writing Month. The goal is to write 50,000 words during the month of November. But what’s the best way to achieve that? Aim to write every day. The target is an average of 1667 words per day, but it’s better to aim higher than that in the beginning if possible, as it can be very hard to catch up if you fall behind right at the start. Your enthusiasm may wane later in the month anyway, so bank extra words whenever you can. Use all your available time – not just that time when you can sit and physically put words down, but the time when you’re cleaning your teeth, or waiting for a bus, or sitting in traffic. Time spent planning means that when you reach the page you’re ready to start the words flowing. The best part of nano is getting totally involved with your story. Even if you are so hard-pressed for time that you can’t fit in your normal writing session, at least aim to open the file and look at it. That’s easier than ever this year, with Scrivener available on iOS. Letting the story drift from your thoughts, even for one day, can be hard to recover from. Don’t worry about the quality of what you write. You’re working out the story. There’s plenty of time to polish later. Sometimes you need to push through to figure out what your story is about. Don’t be afraid to change things as you go along – but don’t go back to fix earlier things. Just make a note to yourself for later and plough onwards. If you must rewrite a section, then leave the original there too for now – they still count as words written during November. Remember that everyone goes through a stage of hating and doubting their writing. Acknowledge that you’ve reached that stage and work through it. You only have 30 days maximum on the one project. After that, you can re-evaluate and do something else instead, but this project deserves its 30-day 50k-words of attention. Other ideas will rear their heads once you open yourself up to creativity. Thank them, note them down and promise them attention in December. If you have the chance, local write-ins can be great for motivation and companionship. There’s nothing quite like sitting at a table with other writers and just hammering out the words. Accept that whatever work you do will probably need to be redone or at least edited thoroughly, but remember that you’ll be that much better as a writer for the regular practice. Most of all, when you hit 1st December, don’t stop writing! Opinions vary on the usefulness of nanowrimo as a writing tool. My opinion is that as long as you don’t expect to write in November, publish in December and then do nothing until the following October, then nano can be a fantastic tool. This entry was posted in writing and checking and tagged first draft, nanowrimo, writing on October 27, 2016 by Lin White. There are many aspects of dialogue to manage, and different ways of tackling it. The aspect that interests me most is the subtext: not just what the characters are saying but what they mean. Think of any family rows you might have. What are they really about? What on the surface is about what’s on TV might be about control. Argument about who you’re going to for Christmas dinner is really about relationships between in-laws. Someone reassuring a member of the family might be seeking to reassure themselves just as much – or even more. When your characters are talking, think about what they’re actually saying, and then think about what they are revealing about themselves as a character. If the conversation isn’t working on both levels, then reconsider if it’s really pulling its weight. Listen to conversations about you, or on TV programmes, and hear the subtext in them if you can. Here’s one quick example I overheard in the summer, by a stall that sold signs for gardens. Now didn’t that just tell you so much about the dynamics of that particular family? This entry was posted in writing and checking on October 19, 2016 by Lin White. It’s as though writers have a limited stock of words and have to get them right first time. If you’re stuck on how to start your story, or a specific scene, then write your way into it. Start with “It was a dark and stormy night”, or “Once upon a time”, or “When he got home”. Then write the rest of the scene. Once it’s all down, go back to that opening that caused so much trouble. Chances are, you’ll find your opening, and just have to delete the waffle in front of it. If you’re not sure how to tackle a particular scene, maybe because you’re uncertain whose POV to use, or what tense to use, or whether to write in 1st person or 3rd, then write it one way and then the other. You’ll gain a deeper understanding of the scene, and a better idea of which works better. And above all, when you reach that point in your story where you feel everything is rubbish and not worth continuing, remember: that’s the point where you prove yourself a true writer. That’s the point when you plough on anyway, remind yourself why you wanted to write that idea in the first place, and just see where you end up. This entry was posted in writing and checking and tagged first chapter, first draft, point of view, writing on July 27, 2016 by Lin White. When do I need a bleed? One issue I’m sometimes asked to sort out is a bleed. So what is a bleed and when is it needed? As part of the printing process, pages are trimmed. 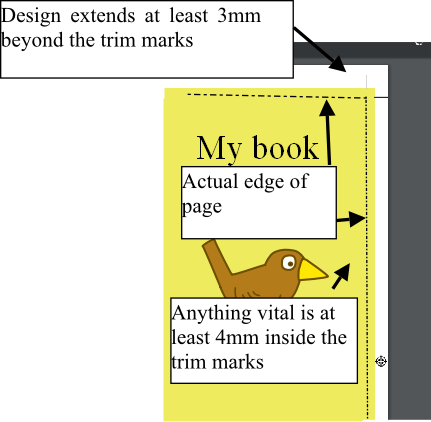 This is not normally an issue on print books, because any text would be well away from the edge, but if you have illustrations or photos in the book that need to go right to the edge, then it’s important to create the image slightly larger than needed. This way, when the page is trimmed, the image will bleed off it. This avoids an unsightly white line showing, should the trimming be a fraction off (which is very possible). This is usually done in publishing software, which has a bleed feature built in to it. 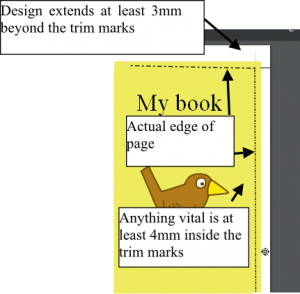 The software will add trim marks to the file, so that the printer can trim to the right size. A bleed is always needed in a cover design. This entry was posted in Layout issues and tagged design, formatting, layout, publishing on June 13, 2016 by Lin White.